Not just for the cafe any more, are they? Certainly not-especially if they’re from two-bite®. Just-right light, tender and sweet, they’re admittedly welcome on any breakfast plate, and tea time wouldn’t be the same without them. But why not break loose a little with these little wonders? 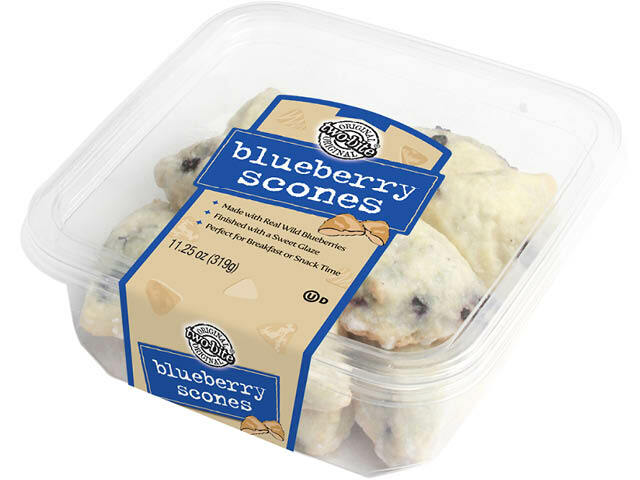 Consider a blueberry scone while you’re on the go. 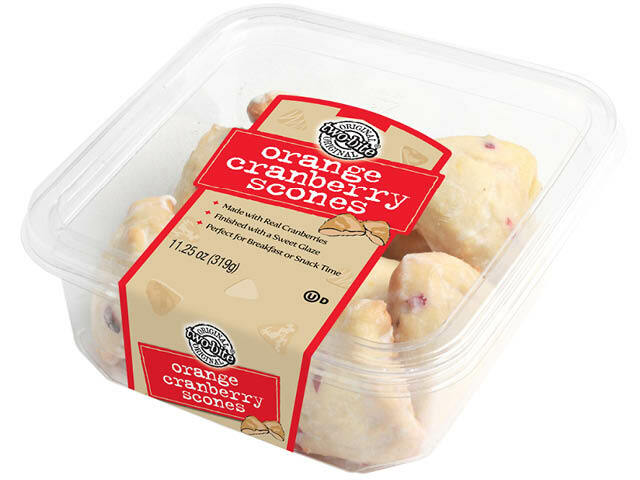 Or pull out some orange cranberry treats at a picnic. The perfect two-bite® size goes anywhere. 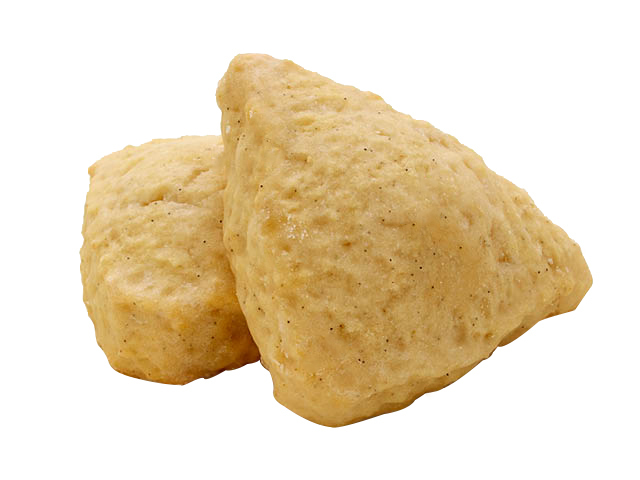 Soft, tender scones, flawlessly flavored with just the right touch of vanilla-then blended with vanilla beans and enrobed in a sweet glaze. INGREDIENTS: ENRICHED WHEAT FLOUR (WHEAT FLOUR, NIACIN, REDUCED IRON, THIAMINE MONONITRATE, RIBOFLAVIN, FOLIC ACID), ICING SUGAR, SUGAR, SHORTENING (PALM, SOYBEAN AND MODIFIED PALM OIL), WATER, EGG, BUTTER (CREAM, SALT), LEAVENING (SODIUM ACID PYROPHOSPHATE, SODIUM BICARBONATE, CORN STARCH, MONOCALCIUM PHOSPHATE, CALCIUM SULFATE), GLUCOSE, NATURAL FLAVOR, SALT, VANILLA BEAN SEEDS, GUAR GUM, MODIFIED POTATO STARCH, XANTHAN GUM. MAY CONTAIN SOYBEAN AND TREE NUTS. 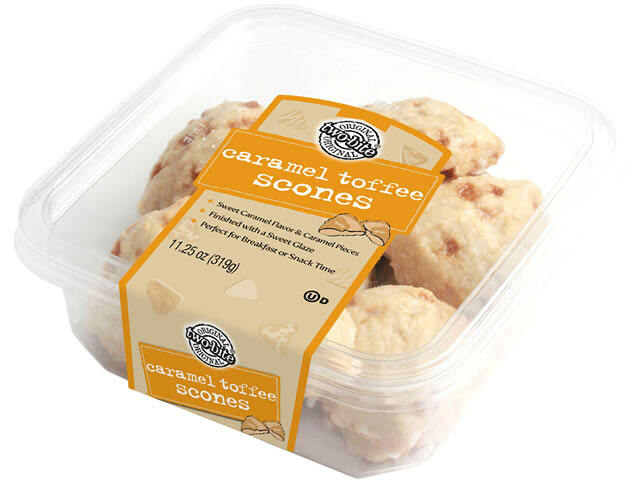 Delightfully sweet caramel scones with chewy toffee chips, perfectly complemented with a subtly sweet scone glaze. 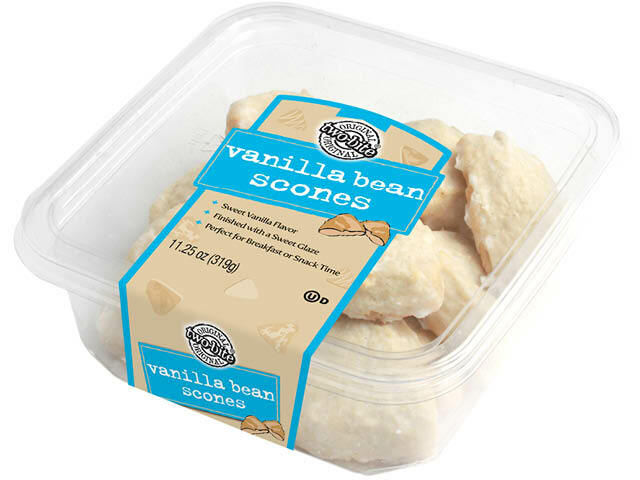 INGREDIENTS: ENRICHED WHEAT FLOUR (WHEAT FLOUR, NIACIN, REDUCED IRON, THIAMINE MONONITRATE, RIBOFLAVIN, FOLIC ACID), ICING SUGAR, SUGAR, SHORTENING (PALM, SOYBEAN AND MODIFIED PALM OIL), WATER, EGG, TOFFEE PIECES (SUGAR, GLUCOSE, BUTTER, WHOLE MILK POWDER, ALMONDS, SODIUM BICARBONATE, SALT), BUTTER (CREAM, SALT), LEAVENING (SODIUM ACID PYROPHOSPHATE, SODIUM BICARBONATE, CORN STARCH, MONOCALCIUM PHOSPHATE, CALCIUM SULFATE), GLUCOSE, SALT, NATURAL FLAVOR, MOLASSES, COLOR (CARAMEL), GUAR GUM, MODIFIED POTATO STARCH, XANTHAN GUM. CONTAINS WHEAT, EGG, MILK AND ALMONDS. MAY CONTAIN SOYBEAN AND OTHER TREE NUTS. 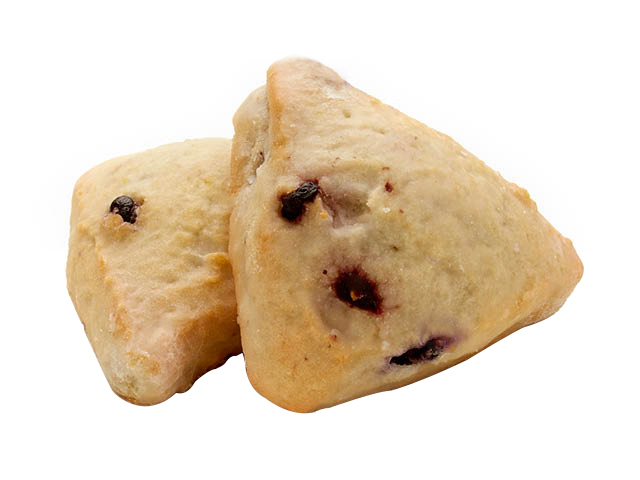 Delicious scones, studded with wild blueberries and wrapped in a divine scone glaze. Go ahead, take another. INGREDIENTS: ENRICHED WHEAT FLOUR (WHEAT FLOUR, NIACIN, REDUCED IRON, THIAMINE MONONITRATE, RIBOFLAVIN, FOLIC ACID), ICING SUGAR, SUGAR, SHORTENING (PALM, SOYBEAN AND MODIFIED PALM OIL), WATER, EGG, BLUEBERRIES, BUTTER (CREAM, SALT), LEAVENING (SODIUM ACID PYROPHOSPHATE, SODIUM BICARBONATE, CORN STARCH, MONOCALCIUM PHOSPHATE, CALCIUM SULFATE), GLUCOSE, SALT, NATURAL FLAVOR, GUAR GUM, MODIFIED POTATO STARCH, XANTHAN GUM, SUNFLOWER OIL..
Can a scone taste like sunshine? Yes. 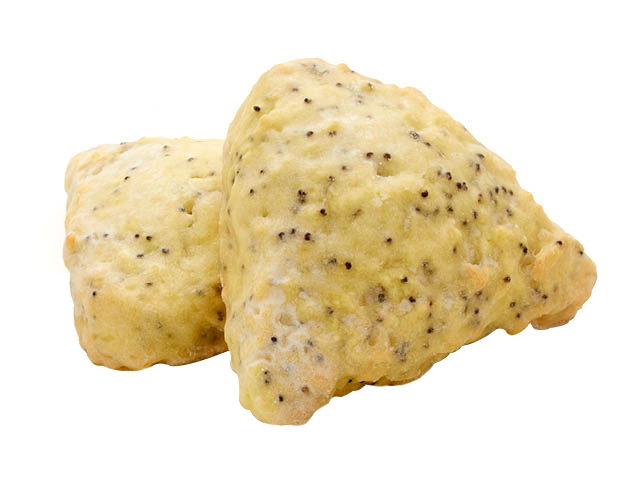 This refreshing lemon scone is blended with poppyseeds and topped with a zesty lemon glaze. 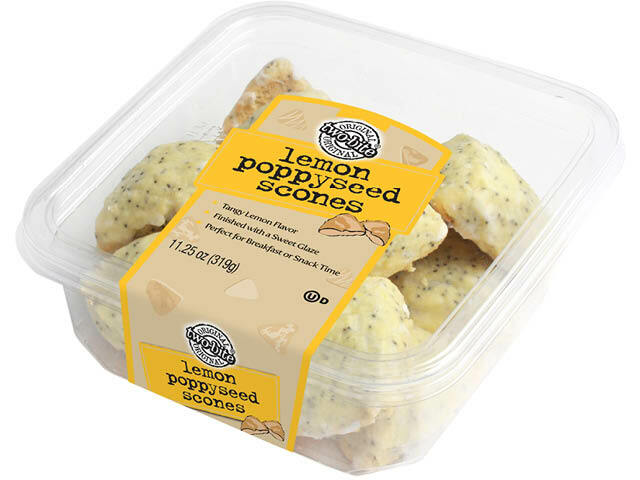 INGREDIENTS: ENRICHED WHEAT FLOUR (WHEAT FLOUR, NIACIN, REDUCED IRON, THIAMINE MONONITRATE, RIBOFLAVIN, FOLIC ACID), ICING SUGAR, SUGAR, SHORTENING (PALM, SOYBEAN AND MODIFIED PALM OIL), WATER, EGG, POPPYSEEDS, BUTTER (CREAM, SALT), LEMON PUREE, LEAVENING (SODIUM ACID PYROPHOSPHATE, SODIUM BICARBONATE, CORN STARCH, MONOCALCIUM PHOSPHATE, CALCIUM SULFATE), GLUCOSE, NATURAL AND ARTIFICIAL FLAVOR, SALT, COLOR (FD&C YELLOW #5), GUAR GUM, MODIFIED POTATO STARCH, XANTHAN GUM. 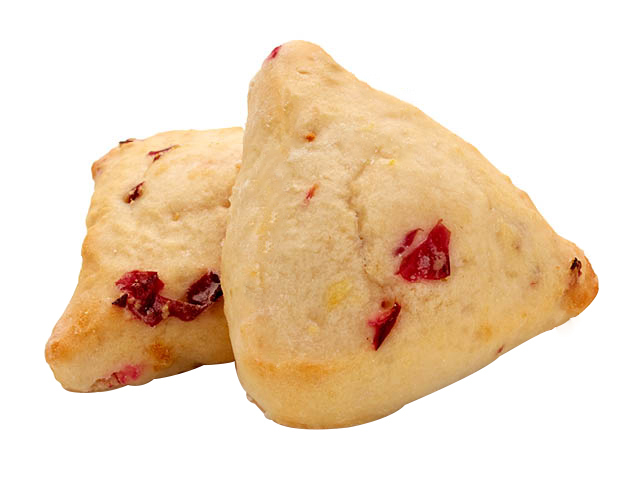 A terrific medley of tangy orange and tart cranberries in a bite-sized scone, topped with a sweet scone glaze. Mouth-watering! 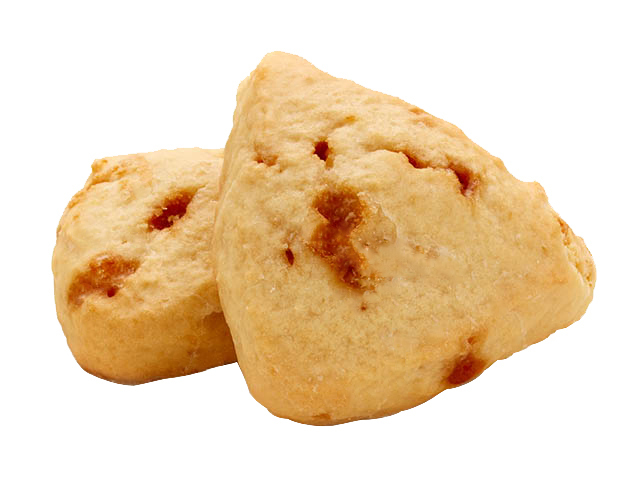 INGREDIENTS: ENRICHED WHEAT FLOUR (WHEAT FLOUR, NIACIN, REDUCED IRON, THIAMINE MONONITRATE, RIBOFLAVIN, FOLIC ACID), ICING SUGAR, SUGAR, SHORTENING (PALM, SOYBEAN AND MODIFIED PALM OIL), EGG, CRANBERRIES, WATER, ORANGE PUREE, BUTTER (CREAM, SALT), LEAVENING (SODIUM ACID PYROPHOSPHATE, SODIUM BICARBONATE, CORN STARCH, MONOCALCIUM PHOSPHATE, CALCIUM SULFATE), GLUCOSE, SALT, ARTIFICIAL FLAVOR, GUAR GUM, MODIFIED POTATO STARCH, XANTHAN GUM.